By PATSY HOLLIS | Isn’t the Tasmanian devil — usually described as a small, quarrelsome animal with sharp teeth and terrible manners when eating — a somewhat unlikely hero and state emblem? Actually, this description doesn’t ring true when you learn more about these small carnivores that that are more likely to run than fight, and play an important part in the Tasmanian ecology. Although not exactly huge — with only the dominant males up to 12kg and 30cm high at the shoulder — the Tasmanian devil is the world’s largest surviving marsupial carnivore. It once roamed mainland Australia but probably became extinct there some 600 years ago. Now, as did the Tasmanian tiger (since then the sad victim of hunting and habitat loss) and several other native animals, the devil has retreated to its last refuge. Devils, natural scavengers, were once plentiful all around the island and were considered a nuisance by the early European settlers for raiding poultry yards and getting into garbage sites. By 1930 the problem was considered such that the Van Diemen’s Land Company offered a bounty to hunters who removed devils — as well as Tasmanian tigers and wild dogs — from their north-western properties. Two shillings and sixpence (25 cents) was the going rate for a male devil, 3/6 (35 cents) for a female. 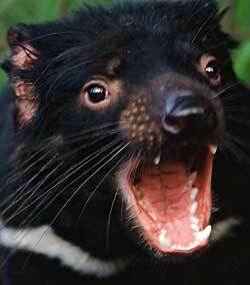 It’s not hard to imagine why the name “devil” stuck, even though these small animals could really be called wimps. If you were an early settler, surrounded by the unfamiliar blackness of a Tasmanian night on the far side of the globe, hearing fearsome noises down near the chook shed, and you bravely investigated, kerosene lamp in hand, to be confronted by a number of small, snapping, growling and screeching black and white animals, with red ears and big teeth, tearing at the carcass of one of your hens, there is every chance in the wavering shadows you would think of them as devils. Even so, some settlers tried to tame them, and from early accounts appeared to have succeeded, though perhaps not for long. The babies are cute and cuddly like many babies, and photographs do show baby devils quite at home in the arms of handlers. 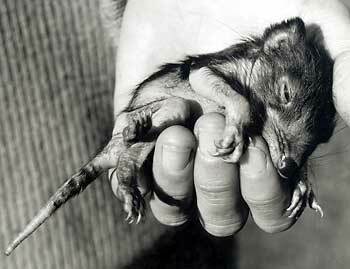 But a baby out of the pouch for a few weeks, whose bite has been described as “like the clamp of a pair of pliers”, is not likely to be kept around for long. And devils, in general, remain very wary of humans. They hide by day in a den or dense bush before venturing out at night to look for food. One report calls devils “nature’s cleaners” because their role in the ecological balance of things is to devour dead carcasses or near-dead animals, including bones and fur. In general they don’t attack living prey. If the bodies they despatch so efficiently were allowed to rot away, those carcasses would become a host for maggots and harbour other diseases. In fact it’s been asserted that devils can be a real asset around farms and grazing areas because they prevent maggots and therefore blowfly strike to sheep. However, it’s feeding that mostly gives Tasmanian devils their fearsome reputation, and if you have ever seen a pack of them squabbling over food, you will understand why. Even so, says one authority, “despite the sounds of their feeding behaviour, much of it is bluff and bluster”. Some of those noises are to establish dominance and are usually made by the bigger males — though not when confronted by a feisty female with young to feed. In fact, most of those devil noises — ranging from coughs and snarls to high-pitched screeches — are part of ritualistic behaviour to scare the opposition off and thus actually minimise the need for fighting, which may indeed be harmful. For devils have sharp strong teeth, and if their snapping jaws connect with a portion of another devil’s anatomy, it can leave scars. Usually the scars are around the hind quarters, the result of an actively feeding animal making painful contact with another equally determined individual.